A love story born out of chaos. Where light and dark both meet. Every story demands to be told. I crave normal with a fierce passion that makes absolutely no sense. The sheltered life I've lived doesn't even begin to cover it. But I want to be brave, fearless even. And life doesn't wait for me to be ready, it just provides. A guy so gorgeous he steals my breath away. He jeopardizes all the tiny little barriers built around me. He's determined to have me. Not the guy I should give my heart to. But he's good at ripping down walls. I have to be honest. I bought this book solely on the cover. The cover is absolutely stunning. When I read what the book was about, I was intrigued as well. Tade Astor is quite the perfect book boyfriend. His father is a politician. He is trying to live the normal life at a small college, spending his time on the water, on the row team. He loves to sail as well. He stumbles upon Reagan and she makes him feel. Makes him want. Want things that he vowed he'd never do. There is something that intrigues him about her from the moment he laid eyes on her. Tade is into one night stands. One and done, no strings attached. What is it about Reagan that makes him want more? Reagan knows Tade's type. Love em and leave em. Or shall I say screw them and leave them. Tade sets out to prove that his reputation doesn't define who he is. Tade wants to spend time with Reagan, so when she agrees, he goes all out. This story was hard to read at times. There are flashbacks in the book of some disturbing events. At times I wasn't quite sure who endured them. By the end of the book, there was a OH MY GOODNESS moment. The past collides with the present at full force. Enough to knock the wind out of you. The ending is EPIC. I adore Tade and it warmed my heart how he treated Reagan. He never pushed her to do anything she wasn't ready for. He was always honest with her and in return only asked her to trust him. 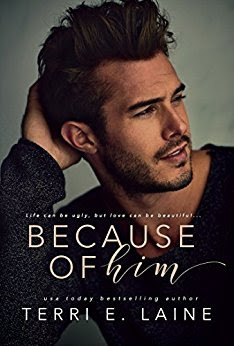 Because of Him has some dark points, yet it is heartwarming and will definitely tug on your heartstrings. The characters in this story are strong, and the story is VERY well written. I love the sub-characters, and hope there will be more to their stories to come. Do I recommend this book. ABSO-FREAKING-LUTELY !!!!! Your heart will go on a rollercoaster ride that you will not want to get off.